Quiet your mind. Feel your body open in ways it is truly able. Reconnect to who you are on a deep spiritual level. Explore yoga in a way that takes you back to the fundamentals of life. As a teacher, I guide this unfolding in each class, listening to and trusting what is needed in each moment. Experience what it feels like to connect with a greater energy flow as you learn how to be in body, mind and a felt sense of spirit. Stretch and strengthen your body, learn breathing techniques, feel how yoga can uplift you. Occasionally we get moved to dance, often I read poetry or spiritual quotes. In responding to the now, the classes are fresh. 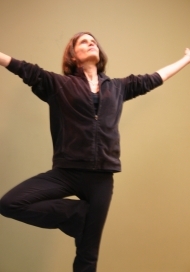 Some classes are slow and meditative, others are energetic and strength building. The classes unfold like life unfolds. The yoga learning restores and renews. Each week this class unfolds differently. We come together and drop into the moment.